Returning to the land of the living, the heroes explore the ruins of the town of Roslar's Coffer, the centre of the devastating blast that hurled them to the afterlife. Populated with newly risen undead, twisted creatures, and wicked cultists of the Whispering Way. Roslar's Coffer offers danger around every corner. Can the heroes escape the poisonous fog that surrounds the town and warn the rest of the world of this rising threat to all life? 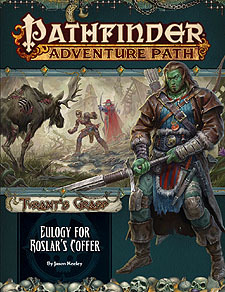 "Eulogy for Roslar's Coffer," a Pathfinder RPG adventure for 5th-level characters, by Jason Keeley. An introduction to several itinerant merchant groups active within the Lake Encarthan region and beyond, by Eleanor Ferron. A close look at the faith of Arazni, the Red Queen, fallen saint and unwilling ruler of an undead land, by Lyz Liddell. A presentation of the machinations and representative members for the nefarious death-obsessed Whispering Way, by Crystal Malarsky. A bestiary of monsters both exalted and corrupt, including two couatls that travel the world to aid others, a humanoid cursed with the touch of undeath, a monstrous undead spawned from tragic loss of life, and an invasive carnivorous plant, by Sarah E. Hood, Luis Loza, Jen McTeague, and Mikhail Rekun.